I absolutely love cooking and baking. I am so excited to get started on the recipe below! Just mouth-watering chocolate goodies, especially when it’s made with Cadbury’s dairy milk chocolate, my favorite type of chocolate in the world besides Cailler and a few other Swiss brands. 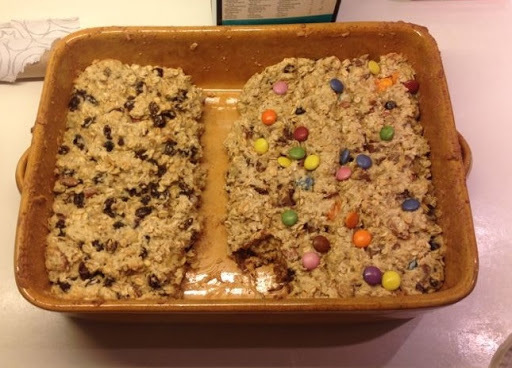 Separate the batter if you want to have one half raisins, one half chocolates. Then add chocolate chips or Cadbury’s chocolate to one bowl, and raisins to the other. Spread the two batters evenly in one square dish that is at least one inch in height. If you want softer Crunchies, cook for 15 minutes. If you want crispier Crunchies, cook up to 20 minutes. I often change the recipe around adding in what I like more and getting feedback from friends and family. I’ve changed this recipe around a lot. Other favorite recipes of mine are chocolate biscottis, crunchies, and walnut oatmeal chocolate fruit banana bread.